Having observed the unexpected behavior of the various metals in regard to the reflection of these radiations, (see Electrical Review of April 1, 1896) I have endeavored to settle several still doubtful points. As, for the present, it appeared chiefly desirable to establish the exact order of the metals, or conductors, in regard to their powers of reflection, leaving for further investigation the determination of the magnitude of the effects, I modified slightly the apparatus and procedure described in my communication just referred to. The reflecting plates were not made each of one metal, as before, but of two metals, the reflective power of which was to be compared. This was done by fastening upon a plate of lead the two metal plates to be investigated, so that the reflecting surface was divided in two halves by the joining line. Furthermore, to prevent any spreading and mingling of the rays reflected from both halves, I divided the lead box into two compartments by a thick lead plate through the middle. Care was taken that the density of the rays falling upon the reflecting surfaces was as uniform as possible, and with this object in view the glass tube surrounding the bulb was lifted up so as to just expose the half-spherical bottom of the latter. The bulb was placed as exactly as it was practicable in the center, so that both halves of the reflecting plate were equally exposed to the radiations. Having failed to obtain, in former experiments, a record for iron owing to an oversight, I tried to ascertain its position in the series by comparing it with copper, using a plate made up of iron and copper. The experiments showed that iron reflected about as much as copper, but which metal reflected better was impossible to determine with safety by this method. Next I endeavored to find whether tin or lead was a better reflector, by the same method. Three experiments were performed, and in each case the metals behaved nearly alike, but tin appeared just a trifle better. Finally I investigated the properties of magnesium as compared with zinc. In fact, the experiments showed that magnesium reflected a little better. I am not yet satisfied, in view of the importance of this relation of the metals with the means employed, and will try to devise an apparatus which will do away with all the defects of the present. The time of the exposure I have found practicable to reduce to a few minutes by the help of a fluorescent paper. In my previous communications I have barely hinted at the practical importance of the use of suitable reflectors. One would be apt to conclude that, since under the conditions of the previously described experiments, zinc, for instance, reflected only three per cent of the incident rays, the gain secured by the employment of such zinc reflector would be small. This, of course, would be an erroneous conclusion. First of all it should be remembered that in the instances mentioned before the angle of incidence was 45 degrees, and that for larger angles a much greater portion of the rays would be reflected. The exact law of reflection is still to be determined. Now, let us suppose the shadow of an object is, taken at a distance, D. In order to get a sharp shadow we must take this distance not less than two feet, and I am finding it more and more necessary to adopt a still greater distance. If, for the sake of simplicity, we assume a spherical bulb and electrode, the radiation will be uniform on all sides, and any element of a surface of a sphere of radius D, drawn around the electrode, will receive an equal quantity of rays. The total surface of this sphere will be 4 π D2. The object, the shadow of which is to be taken, may have a small area a, which gets only an insignificant part of the total rays emitted, this part being given by the proportion a / 4 π D2. In reality we can not assume less than a / D2 π as effective ratio, but even then, if D is very large and the object, that is, the area a, small, this ratio may be still so small that evidently, by the use of a proper reflector, we can easily concentrate upon the area a an amount of rays several times exceeding that which would fall upon it without the use of a reflector, in spite of the fact that we are able to reflect only a few per cent of the total incident rays. 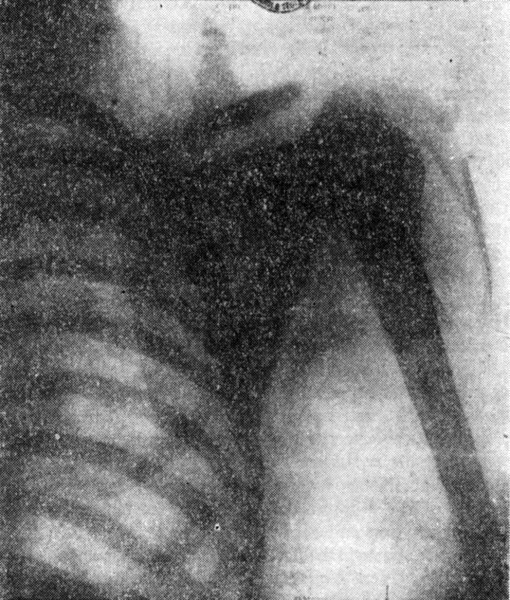 As an evidence of the effectiveness of such a reflector, the annexed print of the shoulder and ribs of a man is shown. A funnel-shaped zinc reflector, two feet high, with an opening of five inches on the bottom and 23 inches at the top, was used in the experiment. A tube, similar in every respect to those previously described, was suspended in the funnel, so that just the static screen of the tube was above the former. The exact distance from the electrode to the sensitive plate was four and one-half feet. The distance from the end of the tube to the plate was three and one-half feet. The exposure lasted 40 minutes. The plate showed very strongly and clearly every bone, and shoulder and ribs, but I can not tell how clearly they will appear in the print. I selected the same object as in my first report in your columns on this investigation, so as to give a better idea of the progress made. The advance will be best appreciated by stating that the distance in this case was much more than double, while the time of exposure was less than one-half. The chief importance of a reflector consists, however, in this, that it allows the use of many bulbs without sacrifice of precision and clearness, and also the concentration of a great quantity of radiation upon a very small area. Since the use of phosphorescent or fluorescent bodies in connection with the sensitive film has been suggested by Professors Henry and Salvioni, I have found it an easy matter to shorten the time of exposure to a few minutes, or even seconds. So far, it seems that the tungstate of calcium, recently introduced by Edison, and manufactured by Messrs, Aylsworth & Jackson, is the most sensitive body. I obtained a sample of it and used it in a series of tests. It fluoresces decidedly better than barium-platino-cyanide, but, owing to the size of the crystals and necessarily uneven distribution on the paper, it does not leave a clean impression. For use in connection with the sensitive films, it should be ground very fine, and some way should be adopted of distributing it uniformly. The paper also must adhere firmly to the film all over the plate, so as to get fairly sharp outlines. The fluorescence of this body seems to depend on a peculiar radiation, because I tested several bulbs, which otherwise worked excellently, without producing a very good result, and I almost gained a false impression. One or two of the bulbs, however, effected it very powerfully. An impression of the hand was taken at a distance of about six feet from the bulb with an exposure of less than one minute, and even then it was found that the plate was overexposed. I then took an impression of the chest of a man at a distance of 12 feet from the end of the tube, exposing five minutes. The developed plate showed the ribs clearly, but the outlines were not sharp. Next, I employed a tube with a zinc reflector, as before described, taking an impression of the chest of an assistant at a distance of four feet from the bulb. The latter was strained a little too much in this experiment and exploded, in consequence of the great internal pressure against the bombarded spot. This accident will frequently occur when the bulb is strained too high, the preceding outward sign being an increased activity and vaporlike appearance of the gas in the bulb and rapid heating of the latter. The process causing the abnormal increase in the internal pressure against the glass wall seems to be due to some action opposite to that noted by Crookes and Spottiswoode, and is very rapid, and for this reason the experimenter should watch carefully for these ominous signs and instantly reduce the potential. Owing to the untimely end of the bulb in this last described experiment, the exposure lasted only one minute. Nevertheless, a very strong impression of the skeleton of the chest, showing the right and left ribs and other details, was obtained. The outlines, however, were again much less sharp than when the ordinary process without the phosphorescent intensifier was followed, although care was taken to press the fluorescent paper firmly against the film. From the foregoing it is evident that, when using the above means for shortening the time of exposure, the thickness of the object is not of very much consequence. I obtained a still better idea of the quality of tungstate of calcium by observing the effect upon a fluorescent screen made of this chemical. Such a screen, together with a paper box, has been termed with the fanciful name “fluoroscope.” It is really Salvioni’s Cryptoscope with the lens omitted, which is a great disadvantage. To appreciate the performances of such a screen, it is necessary to work at night, when the eye has for a long time been used to the darkness, and made capable of noting the faint effects on the screen. In one instance the performance of this screen was particularly noteworthy. It was illuminated at a distance of 20 feet, and even at a distance of 40 feet I could still observe a faint shadow passing across the field of vision, when moving the hand in front of the instrument. Looking at a distance of about three feet from the bulb through the body of an assistant, I could distinguish easily the spinal column in the upper part of the body, which was more transparent. In the lower part of the body the column and the rest were practically not perceptible. The ribs were only very faintly seen. The bones of the neck were plainly noticeable, and I could see through the body of the assistant very easily a square plate of copper, as it was moved up and down in front of the bulb. When looking through the head I could observe only the outline of the skull and the chin-bone, yet the field of vision was still bright. Everything else appeared indistinct. This shows that improving of fluorescence will not aid us very much in the examination of the internal parts of the body. The solution rather will come through the production of very powerful radiations, capable of producing very strong shadows. I believe I have indicated the right way to secure this result. Although it must be admitted that the performance of such a screen is remarkable with the appliances I have used, I have, nevertheless, convinced myself of its still limited value for the purpose of examination. We can distinguish the bones in the limbs, but not nearly as clearly as a photographic impression shows it. Eventually, however, with the help of strong radiations and good reflectors, such fluorescent screens may become valuable instruments for investigation. A few weeks ago, when I observed a small screen of barium-platino-cyanide flare up at a great distance from the bulb, I told some friends that it might be possible to observe by the aid of such a screen objects passing through a street. This possibility seems to me much nearer at present than it appeared then. Forty feet is a fair width for a street, and a screen lights up faintly at that distance from a single bulb. I mention this odd idea only as an illustration of how these scientific developments may even affect our morals and customs. Perhaps we shall shortly get so used to this state of things that nobody will feel the slightest embarrassment while he is conscious that his skeleton and other particulars are being scrutinized by indelicate observers. Fluorescent screens afford some help in getting an idea of the condition of the bulb when working. I hoped to find some evidence of refraction by means of such a screen, placing a lens between it and the bulb, and varying the focal distance. To my disappointment, although the shadow of the lens was observable at a distance of 20 feet, I could see no trace of refraction. The use of the screen for the purpose of noting the effects of reflection and diffraction proved likewise futile.